University of Leicester - Students prepare for dust-up - in space! Team photo: Boys left to right: Adam Bark, Benjie Otieno, David Gray, Phillip Peterson, Peter Hague, Tom McNaught-Roberts, Matthew Cro, Owen Littlejohns, Richard Wrigley, Thomas Conlon, Tim Trent, Luket Fleetham, Jamie Sinclair. Students prepare for dust-up - in space! Undergraduates at the University of Leicester are on target to design, build and launch a student satellite on a real space mission. They have taken delivery of the main body of the satellite donated by Loughborough-based engineering company Magna Parva. The project will result in the satellite going into orbit in mid 2009. 20 students in the renowned Department of Physics and Astronomy are involved in the mission to detect space dust. Laura Evans, one of the programme leaders said: “Students from the department of Physics and Astronomy are involved in a project to design, build and launch a student satellite which will conform to the CubeSat standard developed by California Polytechnic. This is a major undertaking with Leicester undergraduates responsible for everything from inception to launch on a real space mission which will provide new, innovative science. “The University of Leicester's CubeSat project, named PLUME, started in January 2007 and aims to place an active nano-meteoroid dust detector into orbit by mid-2009. This detector will be capable of characterising the near Earth dust environment an order of magnitude better than any previously flown active detector, allowing significant science to be accomplished. 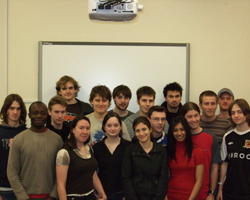 “The project team is comprised of approximately 20 undergraduates who both run and manage the project. The mission has the full support of the University of Leicester's Space Research Centre and of Magna Parva. The team are also under consideration for financial support from the East Midlands Space Academy. “Provided the mission schedule is maintained the satellite is likely to be the first English CubeSat in orbit. Philip Peterson, 2nd year undergraduate working on the ADCS subsystem said:"I'm an undergraduate, and I'm building a satellite. It's just incredible. There aren't many universities in the country where I could get to do something like this." Professor George Fraser, Director of the University's Space Research Centre, said : "It's great to see Magna Parva's generous support helping turn our students' ambitious plans into real hardware"
Andrew Bowyer, Director, Magna Parva Ltd said: “"We at Magna Parva are excited to be helping Leicester's undergraduates fly a very innovative instrument, and in doing so have been impressed by the professionalism of all concerned at the Space Research Centre. “Our intention is not just to contribute financially, but to be involved in the project up to launch. Through this integrated approach, the undergraduates will gain some experience of industry to add to their list of new skills." To contact any of the students involved in this project you can e-mail them directly, or call the University of Leicester Press Office on 0116 252 2415.